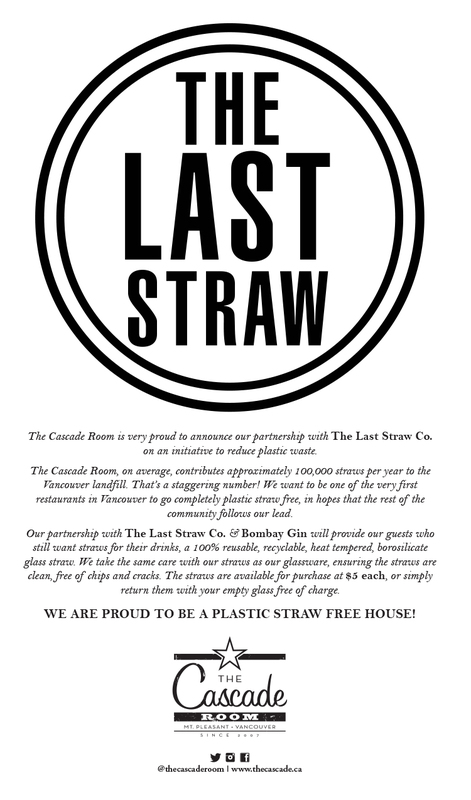 The Cascade Room is very proud to announce our partnership with The Last Straw Co. on an initiative to reduce plastic waste. The Cascade Room, on average, contributes approximately 100,000 straws per year to the Vancouver landfill. That’s a staggering number! We want to be one of the very first restaurants in Vancouver to go completely plastic straw free, in hopes that the rest of the community follows our lead. Our partnership with The Last Straw Co. & Bombay Gin will provide our guests who still want straws for their drinks, a 100% reusable, recyclable, heat tempered, borosilicate glass straw. We take the same care with our straws as our glassware, ensuring the straws are clean, free of chips and cracks. The straws are available for purchase at $5 each, or simply return them with your empty glass free of charge. WE ARE PROUD TO BE A PLASTIC STRAW FREE HOUSE!